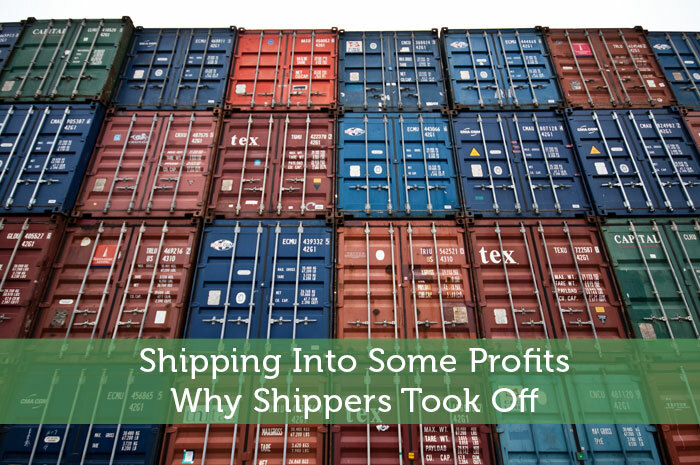 The shipping industry has been pummeled over recent years but as of late, they have skyrocketed to prices that don’t seem to match up with their fundamentals and it has a lot of traders scratching their heads. Since Donald Trump won the presidential election in the beginning of November we have seen the markets rotate money into sectors that investors believe Trump will benefit from his policies including manufacturers, shippers, biotech’s and copper while sectors like technology have taken a hit. This is because under Donald Trump’s proposed plans we could see an increase in inflation and manufacturing which would lead to more exports and a greater need for shipping materials. But perhaps the biggest gaining sector was dry bulk shippers including companies like SHIP, DRYS and SINO. This sector has been neglected for years with stagnate growth but has finally come back to life with Dryships Inc. (NASDAQ: DRYS) leading the way as it caught the attention of traders when it made gains in excess of 2000% in just a weeks time. 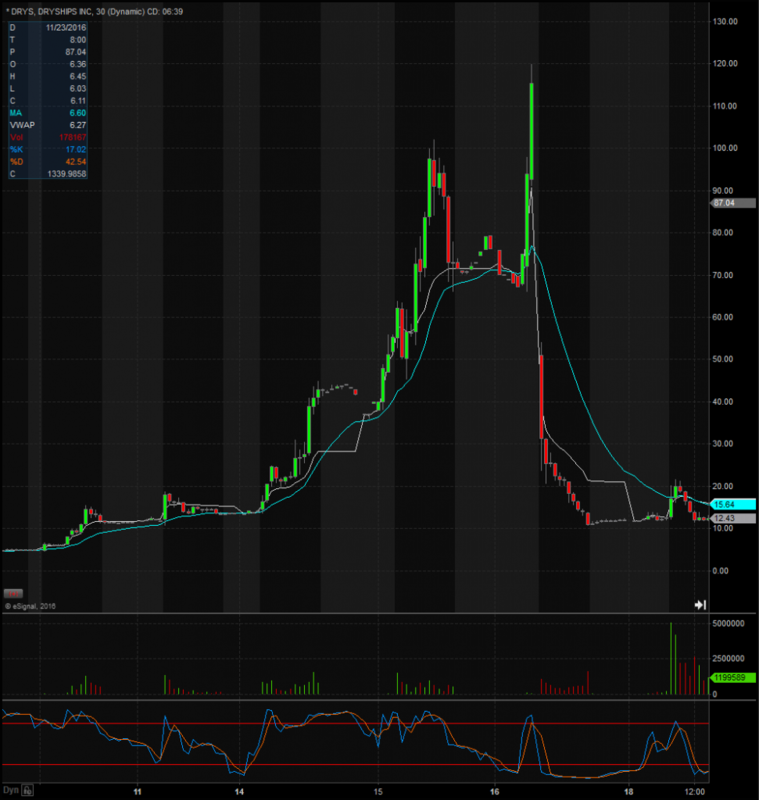 The biggest mover of this bunch was DryShips Inc. (DRYS), which had only been trading in the $4.50 range before going parabolic and exploding to well over $100.00 per share as you can see in the 30-minute chart above, just over a 2100% jump in value, as shorts were squeezed out magnifying the buying and long speculators were jumping on board for the ride. This move pushed DRYS market cap to just over $115 million when it was only at $5 million the week before. Without any policies actually being put in place yet it’s hard to make sense as to why this stocks value went crazy other than speculators pumping the stock up. Shares were halted multiple times into the move before being halted for the rest of the trading day by the NASDAQ until it received “further information” on the company. Following this halt shares came back to reality and sold off to more realistic prices in the $10 range. Traders made and lost millions on this move and is the reason why hard stops are your best friend. This is a prime example of how market speculation can drastically affect a stock’s price and further proves the point that markets are not efficient. SINO and SHIP were also big movers but nothing like the DRYS move. SINO was trading around the $1.00 range before popping to over $14 in just a few days, while SHIP made a similar move from the $2 range to just over $8.50. The sector has seen increased activity and volatility as more traders and investors are paying attention to it now. A key economic indicator called the Baltic Dry Index (BDI) that measures the estimated prices of moving major raw materials via shipping is reaching levels that it hasn’t hit in over two years and is suggesting that the shipping market is picking up steam. President-elect Trump pledge to launch a $1 trillion infrastructure deal along with renegotiating trade deals is behind this spike in the index and if he can follow through with his promises then we could see this index push even higher along with the stock prices of shippers. Expect the shipping sector to remain bullish in the immediate future as Trump settles into his presidential role and we find out more on the policies he will be looking to implement. This sector has been under the radar for quite a while now, so it’s no surprise that it’s picking up steam with the speculation of higher demands as more favorable conditions will most likely be heading their way. Other sectors you may want to follow in this presidential change is banking, manufacturing, construction, biotech’s, oil drillers and the defense industry.